Business Leadership Profiles from Greek Mythology: Petulant Poseidon! Mount Olympus was a family business. We all know somewhere in the organizational chart lurked a moody older brother who would never be “top god” but possessed many useful talents. Hmm, who could that be? 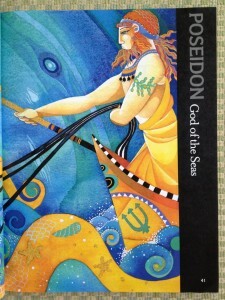 Yep, I’m talking about Poseidon, the Greek god who ended up ruling the wholly owned subsidiary we mortals call The Ocean. He wasn’t almighty like his kid brother Zeus, but he did like to travel the waters in his golden chariot whilst dolphins accompanied him. Talk about the corporate jet lifestyle! Poseidon Was a “Slippery When Wet” Enforcer: According to ancient Greek mythology, Poseidon was the god of the seas, rivers, floods as well as droughts, horses, and earthquakes. We’ll soon get back to that last one. Perhaps because he ended up with the seas, while Zeus acquired the heavenly skies after a game of rock-paper-scissors (Mount Olympus style), Poseidon was a difficult and quarrelsome god. Olive Trees Beat Salt Water as the Best Gift Ever (to Mortals): With a collective eye on the dwelling place of mortals, the Greek gods decided to rule Earth jointly. Similar to certain family business squabbles, this arrangement sometimes led to territorial disputes regarding who was the patron god or goddess of which city. In one famous squabble, Poseidon challenged Athena (um, yeah, only Zeus’s favorite daughter who sprang forth from his forehead) for patron status of Attica. Poseidon gifted the citizens with a spring of salty ocean water in the middle of the Acropolis. However, Athena surpassed Poseidon’s generosity by planting a (more useful and versatile) olive tree. Guess who won? Here’s a clue: The gods decreed the city of Attica would henceforth be known as Athens (and not “Poseidia”). It was tough luck for the boss’s brother to compete with the boss’s daughter, that’s for sure! Is That a Trident in Your Chariot, or Are You Just Quaking to See Me? : While brother Zeus played with his thunderbolts, Poseidon wielded a trident so powerful it could literally shake the earth. One strike from his symbolic three-pointed spear caused mythological tempests and earthquakes. Oh my! But ancient sailors revered Poseidon. He must have put his ability to shatter rocks on hold when some famous Greek mariners attempted to reach the end of the world. Allegedly, Poseidon breathed life into the very first horse, so obviously, he was a creative god. In the mortal world, art directors or top designers can be tempestuous leaders, so grant them the proper work environment and let them soar. Just steer clear of those sharp tridents. Do you recognize any Poseidon-like types within your company or office? Can you harness their creativity while simultaneously trying to avoid the fate of the S.S. Poseidon from that iconic 1972 film? Love him or hate him, Poseidon is a good god to have around when it’s time to purge your organizational chart (or a small, nearby town). Until next time, may the gods and goddesses of brisk business and courageous commerce be with you! Lori Shapiro is the owner of By All Writes LLC, a business writing, editing, and research company in Marlton, New Jersey. She revels in shielding her clients from the pain of writing their own print and web marketing copy. Call her (856-810-9764) or email her (lori@byallwrites.biz) for a no-obligation project quote today!